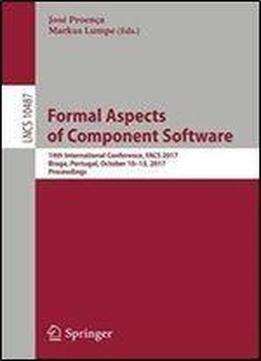 This book constitutes the thoroughly revised selected papers from the 14th International Conference on Formal Aspects of Component Software, FACS 2017, held in Braga, Portugal, in October 2017. The 14 full papers presented were carefully reviewed and selected from 26 submissions. FACS 2016 is concerned with how formal methods can be used to make component-based and service-oriented software development succeed. Formal methods have provided a foundation for component-based software by successfully addressing challenging issues such as mathematical models for components, composition and adaptation, or rigorous approaches to verification, deployment, testing, and certification.